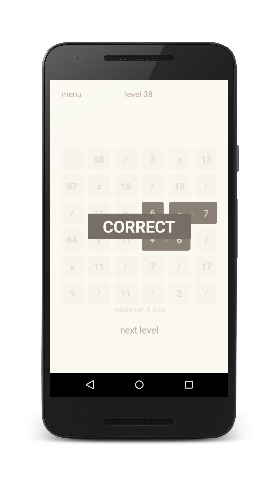 Math on Tiles is puzzle game that involves finding an equation in a set of tiles, for the required answer shown for the level. There are over 300 levels, and the intial levels start of easy, where the number of tiles to find is only 3. Later levels have equations that span 9 tiles! Not only is it fun to play, but you'll be exercising your brain, and improve your maths skills. Selecting the tiles is easy, just select the tile you want to be part of the equation, and click or drag your finger to the adjacent tile. When you think you have the correct equation, click the equals button and see if you are right. then the answer will be 5 and not 7. 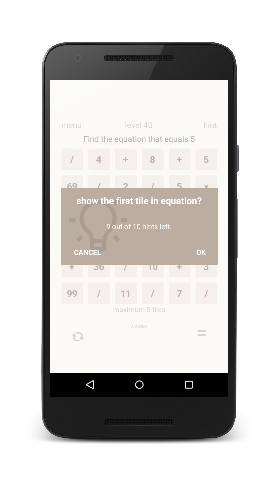 Sure, if your stuck, just click on the hint button, and the first tile in the correct equation will be highlighted. You get 10 hints to use for free, but with a one off fee, you can purchase unlimited hints. You can find Math on Tiles in your app store, or follow the links below.